In a medium bowl, combine the Greek yogurt, mayonnaise, curry powder, to taste, and stir well to combine. Add the eggs and green onions and season with salt and pepper. Gently fold the eggs into the yogurt mixture and taste for seasoning. 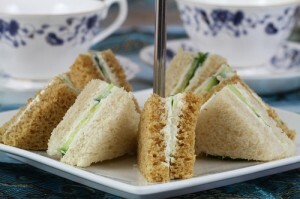 Divide the curried egg salad evenly among the bread slices, and top each slice with 1 piece red leaf lettuce. Cut the sandwiches into quarters and serve immediately.